The dsp.VariableBandwidthIIRFilter object filters each channel of the input using IIR filter implementations. It does so while having the capability of tuning the bandwidth. Create the dsp.VariableBandwidthIIRFilter object and set its properties. vbwIIR = dsp.VariableBandwidthIIRFilter returns a System object™, vbwIIR, which independently filters each channel of the input over successive calls to the algorithm. This System object uses a specified IIR filter implementation. The filter’s passband frequency may be tuned during the filtering operation. The variable bandwidth IIR filter is designed using the elliptical method. The filter is tuned using IIR spectral transformations based on allpass filters. vbwIIR = dsp.VariableBandwidthIIRFilter(Name,Value) returns a variable bandwidth IIR filter System object, vbwIIR, with each property set to the specified value. You can specify additional name-value pair arguments in any order as (Name1,Value1,...,NameN,ValueN). Specify the sampling rate of the input in Hertz as a finite numeric scalar. This property is non-tunable. Specify the order of the IIR filter as a positive integer scalar. This property is non-tunable. Specify the filter passband frequency in Hz as a real, positive scalar, smaller than the SampleRate/2. This property applies when you set the FilterType property to 'Lowpass' or 'Highpass'. Specify the filter passband ripple as a real, positive scalar in decibels (dB). This property is non-tunable. Specify the filter stopband attenuation as a real, positive scalar in decibels (dB). This property is non-tunable. y = vbwIIR(x) filters the real or complex input signal x using a variable bandwidth IIR filter to produce the output y. The variable bandwidth IIR filter object operates on each channel, which means the object filters every column of the input signal independently over successive calls to the algorithm. 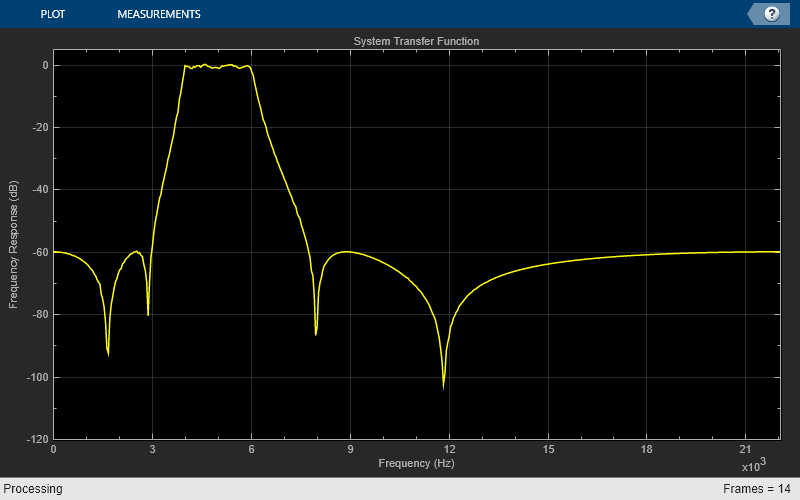 This examples shows you how to tune the center frequency and bandwidth of the IIR filter. This filter covers frequency transformations. A lowpass IIR prototype is designed, using the elliptical method by specifying its order, passband frequency, passband ripple and stopband attenuation. The passband ripple and stopband attenuation are equal to the values of the PassbandRipple and StopbandAttenuation properties. The prototype passband frequency is set to 0.5. If the FilterType property is 'Lowpass' or 'Highpass', the prototype’s order is equal to the value of FilterOrder. If the FilterType property is 'Bandpass' or 'Bandstop', the prototype filter order is equal to FilterOrder/2. The prototype is a Direct Form II Transposed cascade of second-order sections (Biquad filter). The prototype is transformed into the desired filter using the algorithms used in Digital Frequency Transformations. Each prototype SOS section is transformed separately. When FilterType is 'Lowpass' or 'Highpass', the resulting filter remains a Direct Form II Transposed cascade of second order sections. If the FilterType is 'Bandpass' or 'Bandstop', the resulting filter is a cascade of Direct Form II Transposed cascade of fourth order sections. A. G. Constantinides. “Spectral transformations for digital filters”, Proc. Inst. Elect. Eng. Vol. 117, No. 8, 1970, pp. 1585-1590.